Of course, I would love a vintage 60s wall hanging of a house. It occurs to me that during my life, all I ever doodled were: Houses. I have a very deep rooted pathology. This is another treasure that I purchased from the fabulous estate sale time capsule. The photo above shows it handing the home’s entry way, so welcoming. Click through for a close up. I am not sure yet where this will go in my home. But it will, I love it so. 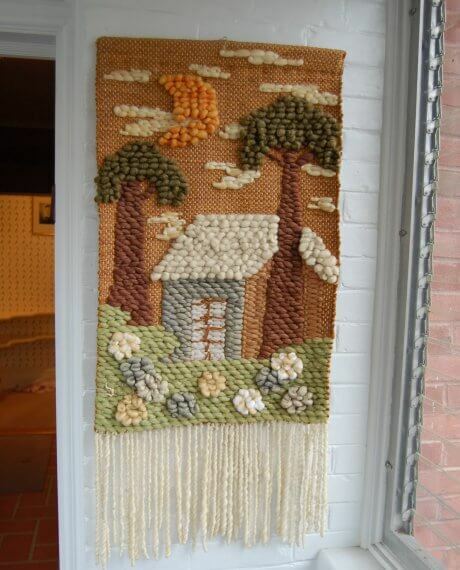 My grandmother Made somthing like this, but insted of a weave, she mounted burlap over some boards and used tiny proken bits of glass to make a picture! Its NOT a mossaic, I Have on of a bird, thats done in all diffrent shades of blue glass. and theres another one lurking in the barn that is of an old Spanish Galleon ship in full sail!